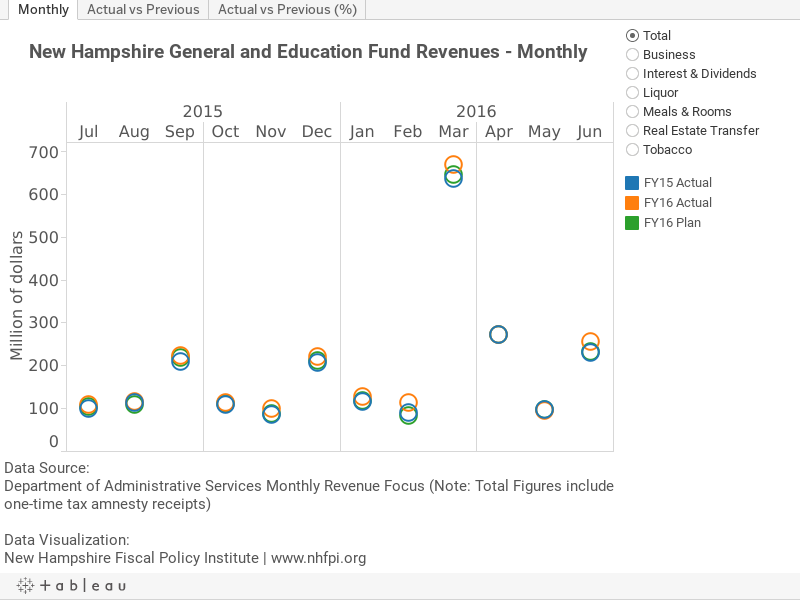 Recent data from the Department of Administrative Services reveals that the General and Education Funds, two of the state’s main sources of revenue, experienced a banner year. Combined collections for these two funds in FY 2016, excluding one-time tax amnesty proceeds, were approximately 6 percent higher than what was yielded during the previous fiscal year, the strongest pace in about a decade. Furthermore, the state collected close to $100 million more than budget writers had projected, allowing the state to strengthen its Rainy Day Fund. While there are nearly twenty revenue streams that comprise the General and Education Funds, only a small subset are the real engines of growth. Specifically, combined business taxes ($74 million), the meals and rooms tax ($19 million), and the real estate transfer tax ($20 million) accounted for practically all of the growth in FY 2016 ($128 million) compared to FY 2015.